New York's Croton water system is the oldest to supply the city and today accounts for around 10% of the drinking supply. A stream in the Croton Watershed; stormwater run-off makes the likelihood of contamination high and there have been a number of pollution incidents historically. 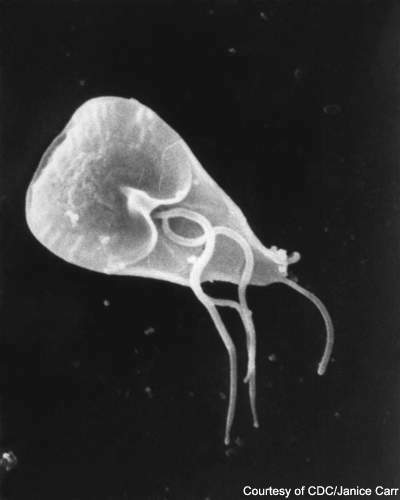 Image of the waterborne parasite Giardia from a scanning electron microscope; changes to Federal law regarding water quality and public health have driven the construction of the new Croton water filtration plant. 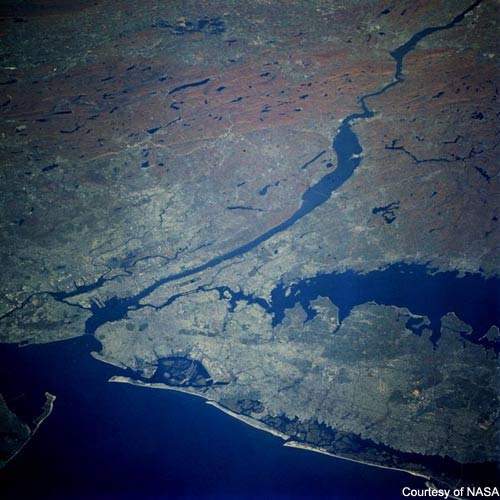 New York and the Hudson River from space. New York receives water from two geographically discrete sources – the Catskill / Delaware watershed, to the west of the Hudson river and the Croton to the east. New Croton Reservoir – one of 12 reservoirs and three controlled lakes in the watershed, responsible for supplying around one million New Yorkers – mostly in the Bronx and parts of Manhattan. The parks of New York; the location of Van Cortlandt Park, underneath which the new filtration plant is to be built, is shown at '2'. The Croton water filtration plant entered service in 2015. The plant ended a long, occasionally controversial, saga that began back in 1989. The plant represents a significant step in improving the water quality of the million New Yorkers who rely on the Croton water system, the city’s oldest, which first began service in 1842. Built entirely underground with deep excavation and extensive rock boring to provide the necessary water tunnels, the four-storey plant ultimately treats around 1.2 million cubic metres a day. This represents roughly 10% of New York’s daily requirement, though the plant is able to increase its throughput to supply around 30% in times of drought or severe need. The original construction contract was for $1.3bn and the cost increased to $2bn by September 2009. The plant was however, constructed at a cost of $3.2bn. New York City comptroller Bill Thompson has stated that the project was overdue and over budget for several reasons, including poor design up front, movement and design changes during the course of the project, slow execution and lack of focus at the management level. 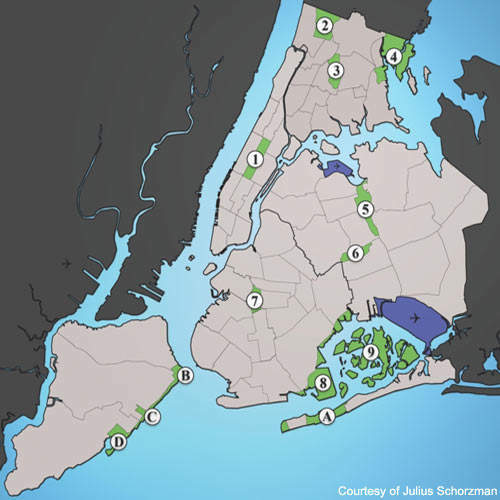 "New York city obtains its drinking water from a system of 19 reservoirs." New York obtains its drinking water from a system of 19 reservoirs located in a watershed which extends to nearly 2,000 square miles. The watershed itself naturally falls into two geographically discrete regions, namely the Catskill / Delaware, to the west of the Hudson River and the Croton to the east, comprising 12 reservoirs and three controlled lakes. 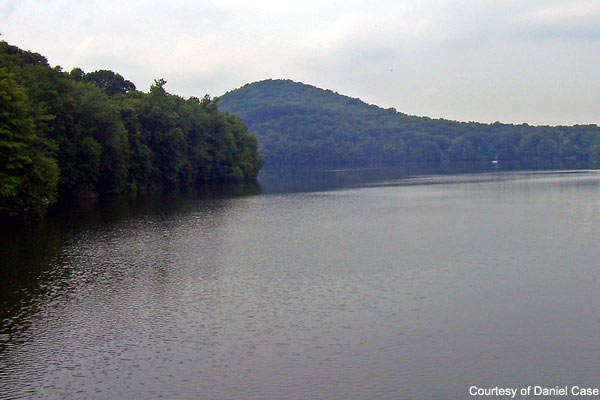 The Croton watershed is particularly exposed to an ongoing threat of contamination, as a result of stormwater run-off and there have been a number of pollution incidents historically. 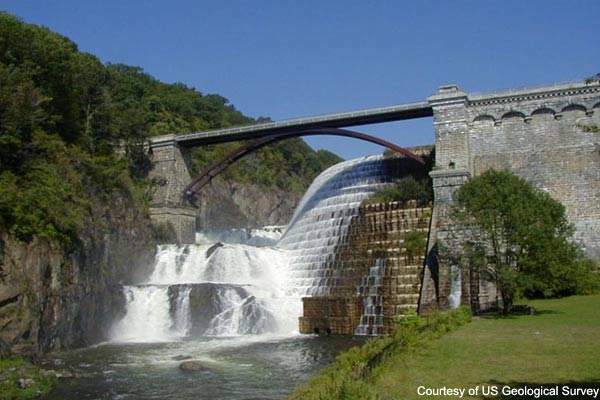 The system was removed from service for periods during 1992, 1993, 1994 and 1998, and shut down entirely for much of 2000 and 2001, when contaminants leaked into the New Croton Aqueduct. 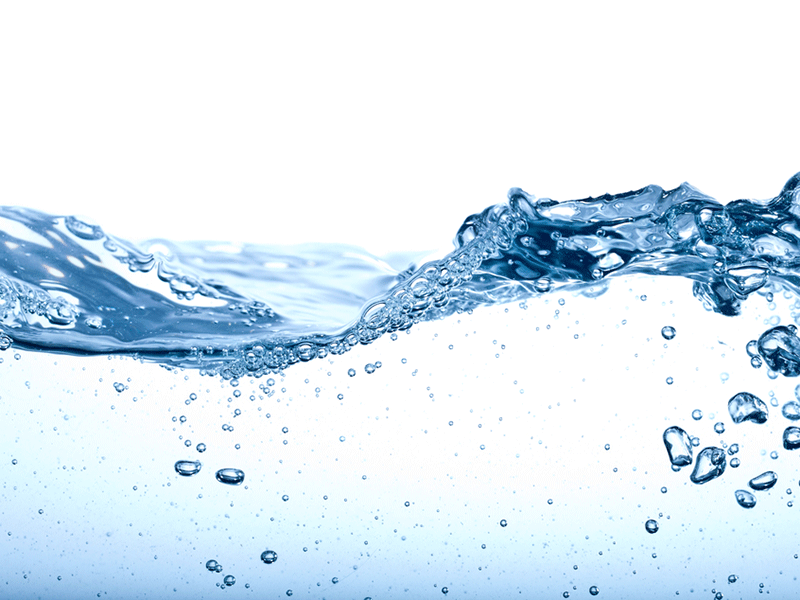 In 1989, the US Federal Environmental Protection Agency (EPA) introduced the surface water treatment rule (SWTR), requiring all surface drinking water to be filtered unless stringent water quality and disinfection criteria are met. Additionally, the safe drinking water act mandated the filtration of all surface water by June 1993 except where compliance with strictly defined public health standards made it unnecessary. In July 1992, New York City Department of Environmental Protection applied for filtration avoidance for the Catskill / Delaware system, which was granted in January 1993. However, no similar waiver was sought for the Croton Watershed. In 1993, the EPA determined that the SWTR applied and that the water from this source would need to be filtered and disinfected. Although planning began for the plant, by 1997 the slow progress led to the federal government bringing a legal suit against the city; the state of New York also intervened on the basis of non-compliance with the relevant state legislation. 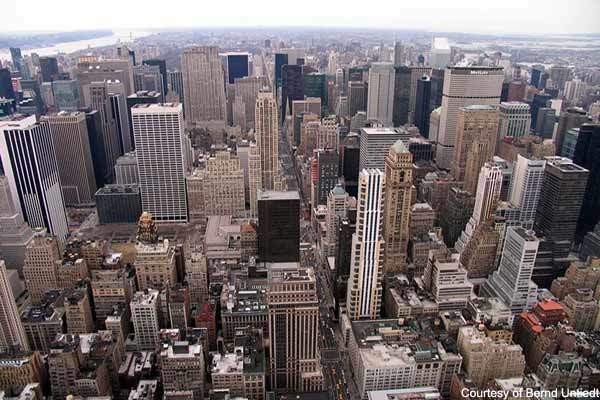 In 1998, in an attempt to resolve the issue in the best interests of the people of New York, all three parties arrived at agreement over a consent decree, which charged the city with building a plant by September 2006. Getting started on the project was to prove difficult. The consent decree was to be twice amended in 2002 and 2004, extending various deadlines because of violations, while missed deadlines for site selection lead to two fines, totalling $180,000. In the end, with residents near the preferred site suing to block the work, site approval was only to come after a State Court ruling. The first phase of the project was started in August 2006. In February 2007, the deadlines for the hiring of a main contractor and the resolution of electrical and HVAC contracts were missed, so the federal government imposed daily fines of $30,000. Two months later, the low bidder, namely a consortium led by the Perini Corporation, pulled out, leaving only one other. In May 2007, the Skanska / Tully Construction JV were awarded the contract, which was finalised in August, Skanska’s 80% share representing the company’s largest order in the US to date. The third phase of construction of the project started in August 2007. By July 2009, excavation of the two treated water tunnels, concrete arrangement for lining the raw water tunnel and installation of mechanical piping and electrical work at the site were completed. Off-site work at the treated water shafts at one of the reservoirs of the Croton system, Jerome Park Reservoir, was also undertaken. Construction of the two treated water tunnels, with a combined length of 2.42km, and the 268m raw water tunnel was completed in February 2011. A tunnel boring machine was used to excavate the twin treated water tunnels, while the raw water tunnel was drilled through 268m of rock. The processes used are largely conventional and well established, with water arriving at the plant undergoing the usual regime of pre-treatment stages, specifically mixing / coagulation, flocculation and chemical balancing. Flocculation is a two-stage process, with a minimum 144-second period for each stage. "The Croton treatment involved a stacked Dissolved Air Floatation (DAF) / filtration." Treatment itself involves stacked dissolved air floatation (DAF) / filtration, the combination of a DAF loading rate of 50gpm and a dual media filter containing 60cm anthracite, 30cm sand being chosen to optimise particulate removal. DAF sludge skimmed solids are dewatered by centrifuge before disposal. The filtered water is then disinfected by treatment with UV and chlorine. After treatment, the water is chemically adjusted as required and subsequently dosed with orthophosphate for corrosion control and hydrofluorosilicic acid to add fluoride. The main construction covered the treatment plant itself, administration offices and an on-site laboratory, and additionally includes chemical storage and facilities for process residuals and backwash water, together with the necessary ancillary electricals, SCADA and piping. Associated work provided a raw water tunnel from the New Croton Aqueduct, with a pumping station and wet well, corresponding pumping arrangements for treated water and a second tunnel linking to the city’s distribution network. Given the magnitude of the undertaking, plant control is a particularly significant aspect of the overall design. To ensure integrated process balancing together with careful monitoring and control of key treatment elements including the backwash and chemical feed facilities, the plant makes use of state-of-the-art digital automation architecture and expert systems. In October 2007, the contract for this part of the plant was awarded to Emerson Process Management, who installed PlantWeb digital automation architecture with the Ovation expert control system to control 15,000 I/O points relating to the new plant’s operation. The whole system calls for the provision of ovation controllers, 12 workstations, four operator interfaces and a variety of ‘smart’ devices, including magnetic flow-meters, pressure and temperature sensor / transmitters and automatic chlorination analysers. To ensure the full integration of the whole facility, the contract also extends to providing the hardware, network design and maintenance of the administration buildings. "The new Croton plant is the first WTP actually located within New York’s boroughs." The new plant is the first WTP actually located within New York’s boroughs, constructed at a 12-acre site within Van Cortlandt Park beneath the Mosholu Golf Course in the Bronx – with ten acres turned back into a municipal golf course upon completion. This inevitably posed some serious construction challenges, including the need to drill, blast and excavate more than 730,000m³ of rock and soil. The final excavation was a 150m × 180m in footprint and lied 30m down in the underlying rock. The two treated water tunnels and a raw tunnel have been constructed to transport water into and out of the filtration system. Originally intended to filter and disinfect 1.1 million cubic metres daily, the additional 100,000m³ a day appeared as part of the latest contract. The project sponsor is the New York City Department of Environmental Protection, who is responsible for running the plant. The main contractor is a Skanska / Tully Construction joint venture, with Haley & Aldrich as geo-technical consultants. Digital automation architecture was provided by Emerson and Hazen & Sawyer / Metcalf & Eddy JV acted as client consultant. AECOM was responsible for delivery of construction management services to the project.